Creeping Thyme Thymus praecox ?Elfin? There are a great many selections of Thyme grown in gardens, all of them with some degree of spicy fragrance. This is a very low, bun or tuft-forming variety. 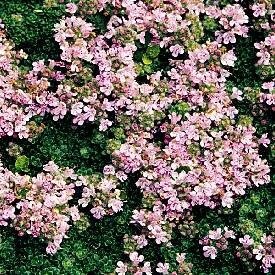 Foliage is grey-green, smothered by soft-pink flowers in early summer. A slower growing form, but still excellent as a drought-tolerant lawn substitute or for planting between flagstones and in the rock garden.